Pintô International presents Living Earth: Contemporary Philippine Art which features the works of over 25 contemporary Philippine artists. The exhibition seeks to bridge the distinct yet interconnected national histories of the Philippines and Italy, creating a dialogue of artistic exchange around humanistic themes: homeland, migration, identity. The exhibition will be on view from May 6-May 12 at Milan’s cultural organization MAC. The exhibition is co-curated by Luca Beatrice, curator of the 2009 Italian Pavilion of the Biennale di Venezia, and Patrick D. Flores, Artistic Director for the forthcoming 2019 Singapore Biennale and formerly the curator of the 2015 Philippine Pavilion of the Biennale di Venezia. As a point of departure, this exhibition begins with the work of Leon Pacunayen (b. 1934), a Perugia-based Philippine artist who immigrated to Italy in the 1960s. “Mountains that hug the earth, skies that are open, and clouds that float.” These are the words used to describe Pacunayen’s sensitive watercolors by gallerist Lyd Arguilla, who in the sixties in Manila founded the Philippine Art Gallery, then the country’s nerve-center of modernism. Pintô International’s exhibition in Milan acknowledges Pacunayen’s artistic contributions, and seeks to reveal the lingering conversation between Pacunayen and Philippine contemporary art. This dialogue encompasses many territories both within and beyond the Philippine national border and brings to light the pervading global influence of Italianate artistic technique. Pacunayen’s moody, atmospheric approach to painting, and his somber palette, can be identified in much Philippine art today yet also adopts the technical lineage of sfumato and chiaroscuro pioneered as early as the Italian Renaissance. 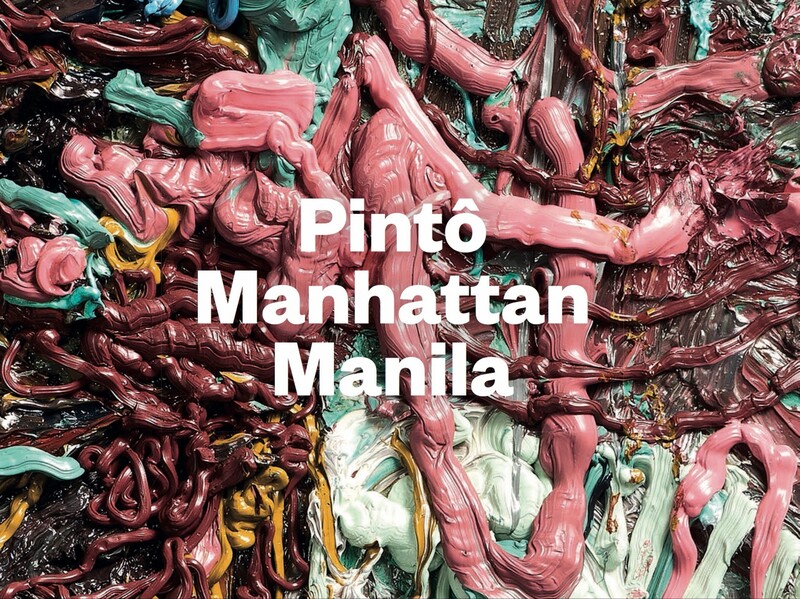 On October 4, 2018 Pintô held the second iteration of its two-part Pintô Manhattan Manila 2, benefit, featuring a two-week exhibition of works by 30 contemporary Philippine artists presented at an off-site location at 74 Franklin Street in TriBeCa. Curated by Antonio Leaño, this was the third exhibition undertaken through the organization’s New York-based headquarters, Pintô International. Sales from the exhibition benefitted the Asian Cultural Council and the Pintô Art Museum. Pintô Manhattan manila, Pt. 1, debuted in 2017 at Donna Karan's Urban Zen in the West Village and later traveled to Tokyo in June of 2018. Honorary Chairs for the event included David and Susan Rockefeller, and Ambassador Teodoro and Louie Locsin. Benefit chairs were Dr. Joven Cuanang and Dr. Luca Parolari. The Benefit Committee included Alice Eduardo, Carla Villacorta, Ernest Escaler, Federico De Vera, Joanna De Asis, Jorge Ortoll, Josie Natori, Lav Diaz, Mercedes Zobel, Rafe Totengco. On June 19, Pintô International presented Pintôkyo, the second global exhibition in Tokyo, Japan, as part of the celebration of the 120th Anniversary of the Proclamation of Philippine Independence. Filipino Ambassador to Japan Jose C. Laurel V and Japanese Ambassador to the Philippines Koji Haneda hosted the opening reception, which featured the works of a substantial group of some of the most accomplished representatives of the Philippines contemporary art scene. In the spirit of Pintô International’s mission to foster cultural diplomacy through contemporary art, the opening reception provided a unique opportunity to cultivate a bilateral relationship between Japan and the Philippines. The exhibit was organized by Pintô International in partnership with the Asian Cultural Council (ACC), and curated by Antonio C. Leaño. In addition to Ambassadors Jose Laurel and Koji Haneda, the event was attended by esteemed members of the nations’ diplomatic circles and government including Kazuko Aso, ACC trustee and mother to former Japan Prime Minister Taro Aso; Ernest Escaler, ACC trustee; Philippines National Artist Benedicto Cabrera (BenCab); Hillside Forum patron Yuji Tsutsumi, among several of the artists featured in the exhibition. On May 22, 2017 Pintô International launched its first benefit: Pintô Manhattan Manila, Pt. 1. The initiative brought to New York City the works of 30 of the most accomplished Filipino contemporary visual artists, including artists X, Y, Z. More than 400 guests attended the opening at Urban Zen in New York City's West Village, introduced by David Rockefeller, Donna Karan, Josie Natori, Drs. Joven Cuanang and Luca Parolari, and curated by Federico De Vera. The revenues of the benefit supported the Asian Cultural Council and the Pintô Art Museum Foundation as an extension of the museum’s mission to promote cultural and artistic diplomacy between Asia and the United States.